My dog and I went for a walk today, between the rainfalls. It was cold outside, and I truly wonder if summer will ever come! As we ventured down an ally, I was blessed with a patch of Irises I absolutely love them! The Iris was used in my wedding, a lovely decoration and they smell so good. So, now when I see them, I am reminded of my wedding day, and my love for my husband. 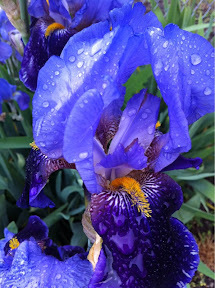 We have often had irises planted in our yard, at various places we've lived. That too, has been delightful. And now, today as I'm walking down a dirt ally, one with no particular beauty, I see The Iris patch. I think it is just like God. He takes someone just like me, dirty with no particular beauty, and He plants Himself IN my heart. Ta-da! Beauty! His Image reflecting off of my character, His love, His Spirit. He makes a very sweet fragrance right out of the stench. Say That Again, Holy Father, You sweeten me up with Your fragrance. You shine and I live for You!